Summer 2017 Elektron released an amazing update for the Analog Rytm drum machine which added a totally new synthesis mode. The new mode is called Dual VCO and is a synthesizer engine not made for making drum sounds, but traditional synthesizer sounds such as bass, leads, bleeps and squeeks. And when we say "traditional", we mean traditional in the "Elektron" way - in other words, not traditional at all. This synth engine is capable of everything from classic analog tones, to complex FM and Ring Modulation timbres with LFO and modulation. Not only that, but the new Dual VCO mode can be used on the first four parts / pads of the Analog Rytm, effectively turning it into a drum machine with four separate monosynths. The sound of the Dual VCO engine is made for bass sounds. We're not saying it's bad for leads or effects. We're just saying that Dual VCO excels at bass sounds. 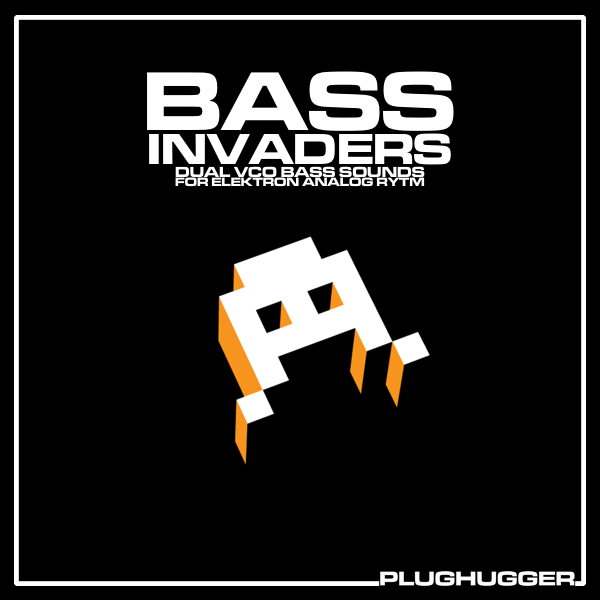 Bass Invaders is a collection of 200 new sounds, entirely focused on bass sounds for all sorts of dance music productions: 303 acid-style squeaks, distorted and saturated basses, plucky stabs, intervals, dark deep house electric basses, modulated & complex tones based on FM and Ring Modulation. From styles as such classic old-school house and techno to progressive and deep house. We played it safe. We made classic bass sounds. We pushed the limits. And we went crazy. Bass Invaders for Analog Rytm contains it all. The soundset comes with instructions on how to install the sounds in your Analog Rytm. Name: Bass Invaders for Analog Rytm. Requirements: Elektron Analog Rytm MkI / MkII with OS 1.45 (Dual VCO). Style: EDM, Modern Pop, Deep House, Classic House, Tech House, Progressive House, Techno, Acid. IMPORTANT - This product contains presets for the Elektron Analog Rytm hardware MkI or MkII. This soundset does not contain any audio files. Please check out the FAQ before buying.